High-speed fractionation can be performed using a column with a high separation capacity. The new LC-20AP preparative pump has improved pressure performance under high flow rates (42 MPa for up to 100 mL/min, 30 MPa for up to 150 mL/min), enabling the use of a higher separation column, so fractionation with high purity can be achieved even for minute quantities of target compounds, such as impurities in pharmaceuticals. 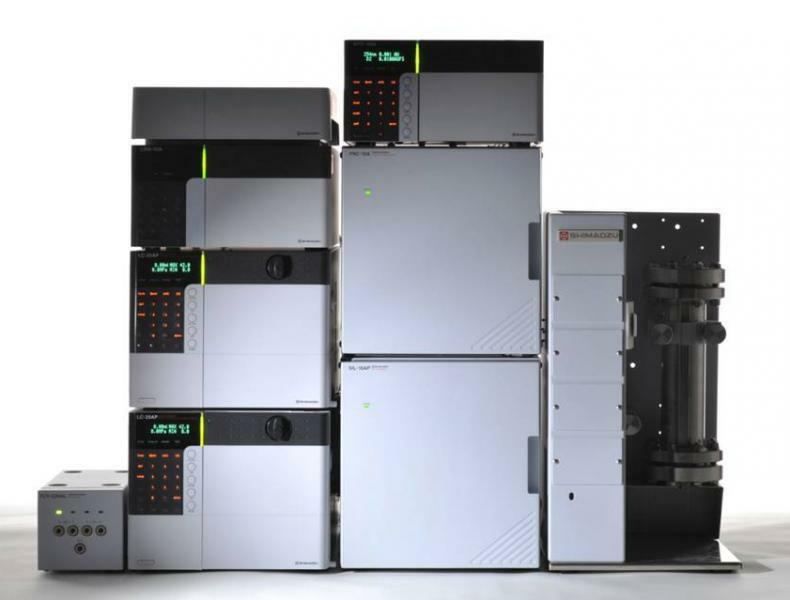 At the same time, the solvent delivery accuracy at low flow rates has been increased, so the system has a high basic performance over a broad range of flow rates from analysis to large-scale fractionation. Furthermore, its power can be used over a wide range of applications from fractionation of natural products to analysis of impurities. In addition to high basic performance, the system is energy efficient, consuming less power and achieving an energy savings of about 41%*. 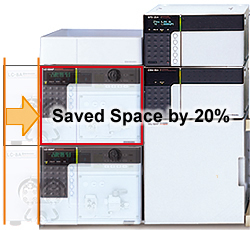 Finally, the width has been reduced from 350 mm (previous model: LC-8A) to 260 mm, for a space savings of about 25 %. * Comparison of measurement results for the LC-20AP and LC-8A for solvent delivery at 5 MPa pressure and 40 mL/min flow rate. This fractionation system uses the LC-20AP solvent delivery unit. The maximum flow rate is a powerful 150 mL/min, and with a 20-50 mm internal diameter column, it is suitable for automatic continuous fractionation. With an analysis column size (1 mL/min), studies of separation conditions or load quantities, or verification of the purity of the fractionated liquid, can be performed. The system can be configured from a variety of optional accessories, such as 5 sample injectors, 3 recycle valves, 2 fraction collectors, etc. This preparative recycle system uses the 6AD solvent delivery unit (maximum flow rate 20 mL/min). A kit that minimizes the internal volume is mounted to enable high-efficiency recycle separation (closed-loop recycle separation). When this system is combined with the appropriate column, it is possible to obtain a theoretical plate number greater than 1 million, making it possible to separate benzene and mono-deuteriated benzene substitute, which have only extremely small differences in properties (see the figure below). Also, if the elution volume until the appearance of the peak is greater than 35 mL, recycle separation can also be performed with an analysis size column (see figure below). Recycle separation is perceived as a time-consuming technique, but in separation of neighboring components, the preparative processing speed per unit time can be increased using recycle separation in which a large amount of sample is injected (see the figure below). This system uses a PEEK polymer for liquid-contacting parts; PEEK is resistant to mobile phases containing halogenated ions and acids. The auto injector, column oven and fraction collector have a cooling function, providing efficient separation at low temperatures. High-sensitivity detectors with a PEEK polymer cell include the UV-VIS, photodiode array, and fluorescence detectors.